For other uses, see Pan (disambiguation). Pan was the Ancient Greek god of pastures, flocks, the mountain wilds and rustic music. In Rome, he was called Faunus. 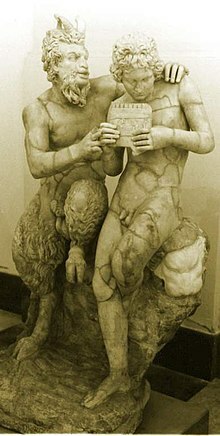 Had the body of a satyr (legs of a goat and body of a human). He was also known to produce an earsplitting sound called a "panic" that caused extreme pain to any who heard it, this sound is actually the origin of the English word panic. He was the lord of the wild and as such, all forest dwelling creatures answer to him, including (but not exclusively) satyrs, nymphs, and forest creatures. Pan was commonly believed to be dead, as a passing sailor heard a call as he passed an island proclaiming "Tell them the great lord Pan is dead." The sailor spread the news, leading to the belief that he is dead, however some still believe that he lives on today, slowly dying as the wilds of the world are destroyed. This page was last changed on 18 April 2019, at 12:03.